Orchids come in a range of sizes from micro-mini to large, some very large indeed. 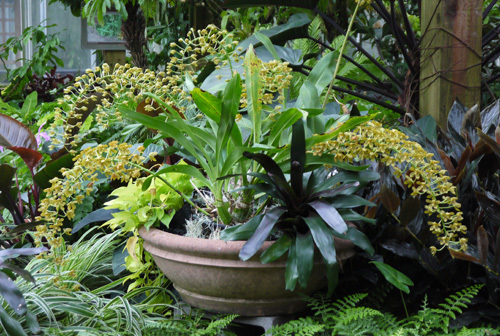 And then there is Grammatophyllum speciosum at the extreme end of the size spectrum, often described as the largest of all orchids. 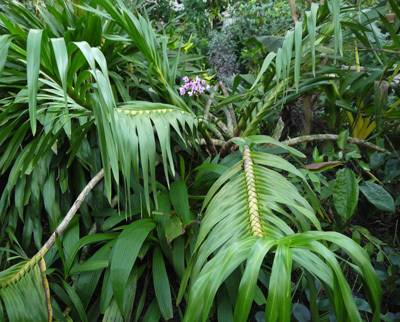 G. speciosum is a sprawling monster with pseudobulbs eventually growing to 9 ft. in length. Phillip Cribb, in the Manual of Cultivated Orchid Species, describes a specimen shown at the Crystal Palace in London in 1851 weighing almost 2 tons. It's a mighty tree that can support such a gargantuan epiphyte. Actually, you are just as likely to come across one in cultivation grown as a terrestrial, with its immense canes arching over the ground like an enormous crab spider. 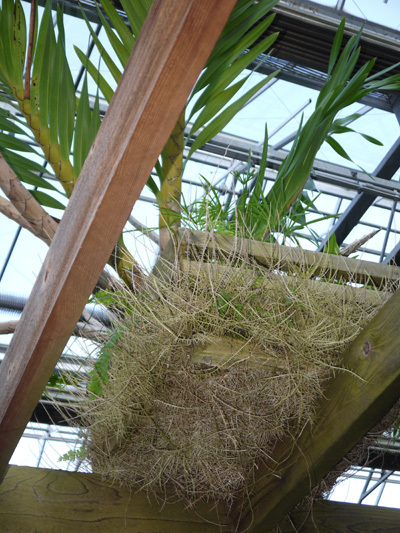 A baby G. speciosum in a basket on top of the cedar pergola. When it grows up it will produce spikes 6 ft. or more in length. Note the wiry trash basket roots which grow upwards and collect nutritious organic matter. Grammatophyllum scriptum has ovoid pseudobulbs and a slightly more compact growth habit. 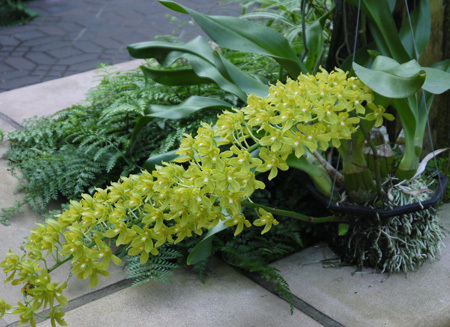 We love it because it flowers magnificently in late summer when most other orchids just want to lounge by the reflection pool with a cold drink. Massive plants, immensely rewarding to grow. G. scriptum is somewhat susceptible to bacterial disease which infects the leaves and can defoliate the plant. We had a bit of a problem with that this spring, but for the most part Grammatophyllum are super easy to grow in a hot climate like ours. They love soaking up the heat and sun on top of our pergola. You do need a lot of space for them.